Cuba Lifts Bible Ban, Could Revival Follow? Editor's Note: As the end of 2018 approaches, Charisma is looking back at the major events of the year, from Billy Graham's death to sexual assault stories to wildfires to the historic North Korea summit and everything in between. The following is one of our top stories of the year. The information presented in the story was accurate at the time of reporting. Continue to follow Charisma News for all the latest updates for these stories and more. This article was published April 13th. 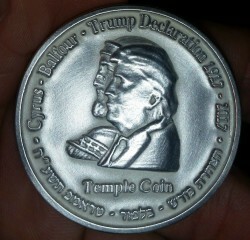 A coin minted to celebrate Israel's 70th birthday has Donald Trump's profile superimposed over King Cyrus on one side and the third temple on the other. It's called the temple coin. "The fact that Orthodox Jews wanted to honor Trump for recognizing Jerusalem as the capital of Israel and they minted this coin—a one-half silver shekel—is as if they are confirming this word given by Christians as valid," says Warren Marcus, the executive producer of It's Supernatural! With Sid Roth. "The great significance is that on one side the coin has the image of Cyrus and Trump. On the other side it has the image of the third temple yet to be built. The one half-silver shekel during the time of the temple was required to be paid as an offering by each male of a Jewish household during Yom Kippur (the Day of Atonement) that was earmarked for the upkeep of the holy temple! It is the hope of the Orthodox Jews who minted this coin that this coin will be actually used to pay that offering again for the upkeep of the third temple," Marcus says. Many modern-day prophets, including Lance Wallnau and Mark Taylor, prophesied Trump would be like King Cyrus of the Bible. The prophet Isaiah wrote: "Thus says the Lord to Cyrus, His anointed, whose right hand I have held—to subdue nations before him and to loosen the loins of kings, to open doors before him so that the gates will not be shut: I will go before you and make the crooked places straight; I will break in pieces the gates of bronze and shatter the bars of iron. And I will give you the treasures of darkness and hidden riches of secret places so that you may know that I, the Lord, who calls you by your name, am the God of Israel" (Isa. 45:1-3). The coin, a joint effort of the nascent Sanhedrin, the Mikdash (Temple) Educational Center and the United Temple Movements, was prepared to honor Israel's 70th anniversary next week on April 19, Breaking Israel News reports. Divine Providence and a Big Question: If God Was Behind the Election of Donald Trump, Is He a Cyrus (Deliverer) or Nebuchadnezzar (Agent of Judgment)? "In the context of the coin, we are expressing gratitude for President Trump's bold decision to transfer the American Embassy to Jerusalem, thereby recognizing King David's capital and the site of Solomon's temple as the true capital of Israel," Mordechai Persoff, head of the Mikdash Educational Center, a non-profit organization for education about the Temple, tells Breaking Israel News. "They are non-Jewish leaders who played an essential role in the return of the Jews to Jerusalem. Hopefully, Trump will continue in this path and, like Cyrus, play a central role in the building of the temple," Persoff says. Marcus says the coin is an example of further biblical prophecies coming to fruition. "We are truly living in the end times," Marcus says. "The parable of the fig tree blooming speaks of Israel becoming a nation again. The recapturing of Jerusalem during the six-day war helped serve as the fulfillment of Jesus' prophecy. He said, 'This generation will not pass away without seeing the millennial kingdom of God established in the earth.'" 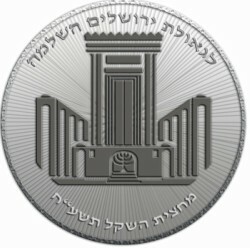 The temple coins are available from Mikdash Educational Center for a $50 donation. Proceeds from the coin sales will be used for educational endeavors, including re-enactment of temple services. Eventually, the proceeds may fund the actual building of the third temple.